October 2 is the 275th day of the year(276th in leap years) in the Gregorian calendar.There are 90 days remaining until the end of the year. 1528 – William Tyndale publishes The Obedience of a Christian Man , which advocates the divine right of kings. 1928 – The "Prelature of the Holy Cross and the Work of God", commonly known as Opus Dei , is founded. Year 829 (DCCCXXIX) was a common year starting on Friday of the Julian calendar. 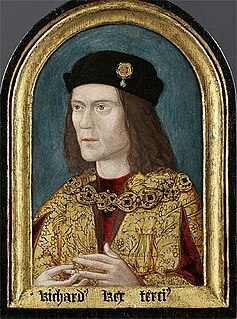 Richard III was King of England and Lord of Ireland from 1483 until his death at the Battle of Bosworth Field. He was the last king of the House of York and the last of the Plantagenet dynasty. His defeat at Bosworth Field, the last decisive battle of the Wars of the Roses, marked the end of the Middle Ages in England. He is the protagonist of Richard III, one of William Shakespeare's history plays. Year 534 (DXXXIV) was a common year starting on Sunday of the Julian calendar. At the time, it was known as the Year of the Consulship of Iustinianus and Paulinus. The denomination 534 for this year has been used since the early medieval period, when the Anno Domini calendar era became the prevalent method in Europe for naming years. Michael II, , surnamed the Amorian or the Stammerer, reigned as Byzantine Emperor from 25 December 820 to his death on 2 October 829, the first ruler of the Phrygian or Amorian dynasty. Batik Day is an Indonesian cultural day for celebrating batik — the traditional cloth of Indonesia. It is celebrated on October 2 and marks the anniversary of when UNESCO recognized batik as a Masterpiece of Oral and Intangible Heritage of Humanity in 2009. At the day, in Jakarta, the map of Indonesian batik diversity by Hokky Situngkir was opened for public for the first time by the Indonesian Ministry of Research and Technology. The Indonesian government strongly encourage Indonesian people to wear batik annual on the holiday and on Fridays to commemorate the day. Wearing batik every Friday has also been encouraged in private companies. Wikimedia Commons has media related to October 2 .